Trained by Chad Brown, Fifty Five followed a familiar playbook coming into the race. The daughter of Get Stormy concluded both 2017 and 2018 campaigns with a one-length victory in the Ticonderoga Stakes on Empire Showcase Day. Following a winter freshening, she returned both years in the Plenty of Grace and, both times, drew the rail in a field of five. In 2018, however, she had to play second fiddle and runner-up to her stablemate Uni, who won the race under Irad Ortiz, Jr. before going on to become a Grade 1 Matriarch winner. This year, Uni was not in the picture and Fifty Five was teamed up with Ortiz. The pair was favored to win at 50 cents on the dollar. Exiting the gate uneventfully, Fifty Five – a confirmed closer – assumed her customary position at the tail end of the group, about five lengths off Coffee Crush, who carved out honest early fractions of 23.44 and 47.55. Relaxed at the fence along the backstretch, Fifty Five waited until the turn to launch her bid, coming off the rail. Splitting horses and advancing into second late in the bend, she drew a bead on the pacesetter once she straightened away. Powering to the front in mid-stretch, Fifty Five cruised to a 1 3/4-length victory in a final time of 1:36.10 over the “good” turf. The competition for the remaining spots behind the winner was fierce. Ultimately, New York-bred Conquest Hardcandy, who saved ground throughout, earned second after a determined drive, finishing a half-length ahead of Coffee Crush. A neck back Thais (also running for Brant and Brown) finished fourth. Silent Sonet completed the order of finish. 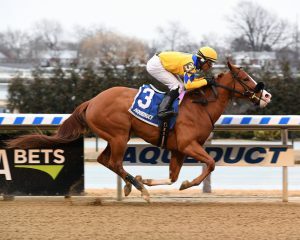 A pair of MTOs – New York-bred Frostie Anne and Crimson Frost – were scratched. As honest and consistent as they come, Fifty Five has won five of her last eight starts, eight races in all and finished on the board in sixteen of seventeen career outings. Winner of her lone start at two on November 1, 2016, she took the Grade 3 Florida Oaks in stakes-record time and restricted Ticonderoga Stakes at three. At four Fifty Five annexed the John Hettinger and repeated in the Ticonderoga. Her earnings currently stand at $716,288. Bred by John and Sandy Crowe’s Empire Equines and foaled at Berkshire Stud in Pine Plains, Fifty Five is one of two winners out of Empire’s homebred mare Soave by Brahms out of New York-bred Cozzene mare Cozzekiki. Fifty Five RNA’d for $24,000 at the 2015 Fasig-Tipton Kentucky October yearling sales only to emerge as Get Stormy’s first stakes winner when she won the Florida Oaks at Tampa Bay Downs. Brant purchased the filly privately from Empire Equines’ John Crowe after the Florida Oaks, which she won for trainer Tom Bush. The odds were that, with four entries in a field of six older fillies and mares, Linda Rice would take a trip to the winner’s circle after Aqueduct’s featured $100,000 Correction Stakes. In the end it was her lone New York-bred who took her there. Lady Sheila Stable and Iris Smith Stable’s Startwithsilver (Jump Start), whose late-running style fit the race shape to a tee, mounted a perfectly-timed rally to win the race from off the pace by a neck. 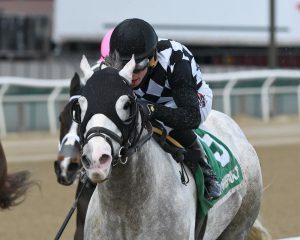 Third in the 2018 renewal of the six-furlong Correction to Sounds Delicious – also a Rice-trainee who was back this year to defend her title – 6-year-old Startwithsilver was looking for her first win since last April 8, when she annexed an open second-level allowance race. 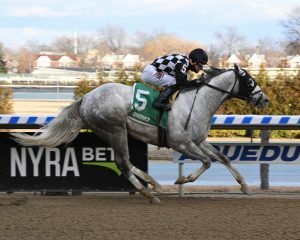 The grey’s strong record at Aqueduct, where she had won four of six starts, along with a closing style in a speed-laden field, drew the support of bettors, who sent her off as the 5-2 second choice under Junior Alvarado, who had piloted her to three prior wins, including the Broadway Stakes last year. In the early stages Startwithsilver raced at the rear of the field in tandem with relative longshot Honor Way, while speedy fellow-New York-bred Filibustin shot to the front from her outside post, leading the field by a length through an opening quarter in 22.64. As the field made its way along the backstretch and around the far turn, the first flight closed ranks on Filibustin. Once the half went in 46.28, Sower and Sounds Delicious lined up with the leader across the track. Startwithsilver, now in fifth with a five-length deficit to make up, began to forge a path to the finish line eight-wide. In a perfectly timed move by Alvarado, she struck the lead in the final sixteenth before going on to win by a neck in a final time of 1.11.19. Yorkipoo Princess closed into second, while Sounds Delicious stayed on for third. Completing the order of finish were Sower, Honor Way and pacesetter Filibustin. [VIDEO REPLAY]. 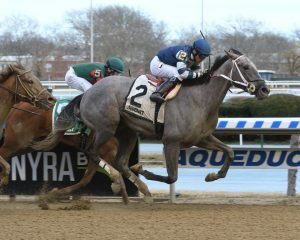 Startwithsilver began her 6-year-old year finishing fifth in the Broadway Stakes on February 16. The supposition that she needed the start after eight months on the bench, was confirmed by Rice, who added that she believed the mare was primed for a big effort in the Correction. 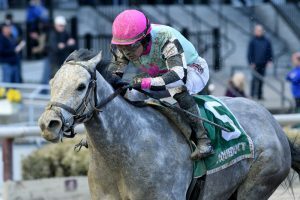 Startwithsilver began her career on the green, making 11 of her first 13 starts on grass – and with good reason: her dam Office Miss won three turf stakes. In her fourteenth start at the beginning of her 5-year-old campaign the grey made a full transition to dirt sprints and found a niche for herself. 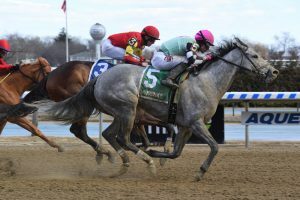 She won through her state-bred second-level allowance condition and won last year’s Broadway Stakes in her stakes debut with a last-to-first move. She also collected placings in last year’s Correction and Pimlico’s Skipat Stakes. Bred by Burning Sands Stable and foaled at Rockridge Stud in Hudson, Startwithsilver, was purchased as a yearling by Raul Reyes’ Kings Equine at the 2014 Fasig-Tipton Kentucky fall sale for $32,000. Rice picked her up at the 2015 Ocala Breeders’ Sales Company’s Spring sale of 2-year-olds in training for $180,000. She is the final reported foal for her dam Office Miss, who produced five winners in all. Startwithsilver’s record now stands at seven wins, five seconds and three thirds from 21 starts, with $412,059 in earnings. Tabbed as the “horse to beat” in the 1 1/8 mile Grade 3 Jeff Ruby Steaks for 3-year-olds over the Turfway Park Polytrack Saturday and sent off as the overwhelming 3-5 post time favorite of in the field of 11, Somelikeithotbrown obliged his backers and connections alike with a 3 3/4-length victory. The Jeff Ruby, a stop on the “Road to the Kentucky Derby,” gives the bay colt, who is sired by Kentucky Derby winner and New York sire and Big Brown (Irish Hill & Dutchess Views Stallions), 20 points toward a berth in the Churchill Downs starting gate on the first Saturday in May. Following turf successes as a juvenile for Mike Maker, who trains for co-owners Skychai Racing and Sand Dollar Stable, Somelikeithotbrown flashed talent in his first try on Polytrack. 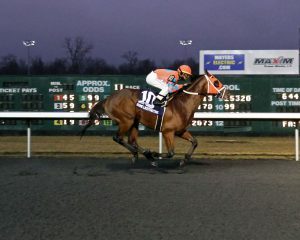 On February 15 in his sophomore debut he won Turfway’s local prep for the Jeff Ruby – the $75,000 John Battaglia Memorial – by more than three lengths under Rafael Hernandez. On Saturday, he was paired for the first time with Gulfstream-based jockey Tyler Gaffalione, after posting an interim 5-furlong maintenance drill at Turfway on March 2. Breaking on the muscle from post 10, Somelikeithotbrown vied early with Five Star General for the lead and and struck the front as the top two powered through early fractions of 23.61 and 47.03. Maintaining a comfortable one-length advantage over the competition along the backstretch and around the far turn, Somelikeithotbrown drew off in the stretch after a quick six furlongs in 1:10.78. He went on to secure 3 3/4-length victory in a final time of 1:52.05. Although he did not have to face a serious challenge from any of his rivals, the colt did a good deal of wandering in and out in the late stages of the race as he did in the Battaglia. As in the prep, he was far enough ahead late that there was no price to pay. Dynamic Racer, Battaglia runner-up finished second, while Moonster rallied from well back for third. Debuting off-the-board at Saratoga in an off-the-turf sprint race, Somelikeithotbrown has not finished out of the money in six subsequent starts, while keeping formidable company. Second out at Spa Somelikeithotbrown came from far back to blow away his rivals by eight lengths while stretching out all the way out from 5 1/2 to 9 furlongs. Launching the stakes portion of his career, he came up just short of Opry to finish second in the Grade 3 With Anticipation at Saratoga, then finished second by three-quarters of a length when collared in the Grade 3 Pilgrim. Somelikeithotbrown wrapped up his juvenile campaign with a game third in Breeders’ Cup Juvenile Turf. Somelikeithotbrown’s first graded score in the Jeff Ruby brings his earnings total to $363,478 with three wins two seconds and a third in seven starts. Bred by Hot Pink Stables and co-owner Sand Dollar Stable and foaled at Sequel Stallions New York, Somelikeithotbrown’s name pays tribute to the names of his sire Big Brown and dam Marilyn Monroan, while alluding both to the comedic masterpiece “Some Like It Hot” starring Marilyn Monroe, Tony Curtis and Jack Lemmon, and a legendary dish served at Louisville’s Brown Hotel named the Hot Brown. Marilyn Monroan, a Kentucky-bred placed runner by Tapit, has a juvenile colt by Mission Impazible, a yearling colt by Temple City and was bred in 2018 to Palace Malice. 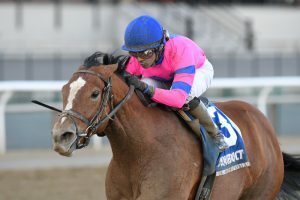 Espresso Shot (Mission Impazible), winner of the East View Stakes in her juvenile finale, got her sophomore campaign off to rousing start when she passed rivals in the stretch to win the $250,000 Busher Stakes for 3-year-old fillies at Aqueduct Saturday. Campaigned by NY Final Furlong Racing Stable and Maspeth Stable, Espresso shot earned 50 qualifying points toward a start in the Kentucky Oaks. This was the second year in a row that a New York-bred found the Busher’s winner’s circle, after Midnight Disguise rallied to win the race last year. The 4-1 third choice in the robust field of 10, Espresso Shot exited the gate cleanly to go the one-turn mile under jockey Eric Cancel, the same trip and rider as the East View. The bay filly was content to occupy the rear guard in the early stages of the race while Excess Capacity led the way through an opening quarter in 23.51, and was joined on her outside by Filly Joel, Please Flatter Me and Orra Moor. Coming off the rail on the backstretch and gaining a couple of spots on the closely-bunched group, Espresso Shot went three-wide in the far turn. Up front, as the half went in 46.58, Excess Capacity yielded the lead to Filly Joel. 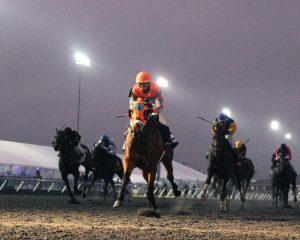 Advancing into contention by the quarter pole and widest of four fillies stacked up across the track, Espresso Shot moved in tandem with a fifth contender Oxy Lady. Both had Please Flatter Me, Orra Moor and Filly Joel Still to run down after six furlongs ticked by in 1:11.44. Wearing down her rivals, Espresso Shot struck the front just in advance of the sixteenth pole and edged off to win by three-quarters of a length in a final time of 1:37.69. In six career starts Espresso Shot has only had one sub-par outing. Third on debut at Saratoga on August 16 in a turf sprint, the bay came back on September 14 to break her maiden going 1 1/16 miles in an off-the-turf event. Following a tough outing in the Grade 2 Jessamine Stakes at Keeneland where she finished last after being steadied in the first turn, Expresso Shot aced the Key Cents stakes before a brief freshening at Palm Meadows Training Center in Boynton Beach, Florida. From three wins, a second and a third the filly has earned $262,975. Bred by Twin Creeks Farm and sired by New York-based third-crop sire Mission Impazible (Sequel Stallions), Expresso Shot is out of Glory Gold, a winning daughter of Medaglia d’Oro bred in New York by Dr. Lance G. Bell. Glory Gold was purchased by Twin Creeks Farm for $125,000 at the 2013 Keeneland November sale and has since changed hands twice, most recently when snapped up by Final Furlong Racing for $13,000 at this year’s renewal of the same sale. On February 14, 2019 she foaled a filly by Firing Line. Espresso Shot, originally sold as a short yearling at the 2017 Keeneland January Sale for $22,000, before being purchased later that year by Final Furlong Racing for $69,000 at the Fasig-Tipton preferred New York-bred yearling sale in Saratoga. 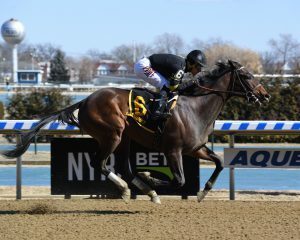 Stonesintheroad, a homebred for Shirl and Mary Ann Penney’s Team Penney Racing, drove her race record to a perfect three-for-three at the Big A on Saturday when she went straight to the front and never looked back in the featured $100,000 Franklin Square for New York-bred 3-year-old fillies. A chestnut daughter of New York sire Bustin Stones (Waldorf Farm), Stonesintheroad came into the Franklin Square following a pair of good-looking wins by a combined 10 1/4 lengths to begin her career for trainer Jeremiah Englehart. 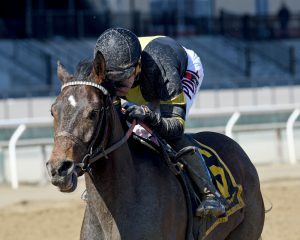 Debuting at 5 1/2 furlongs at Aqueduct on December 30, she stalked and pounced over “good” going to win a New York-bred maiden special by four lengths. Taking on allowance foes at six furlongs at the same venue on February 3, she made it look even easier, wiring the overmatched field by 6 1/4. In the Franklin Square Stonesintheroad was sent out for the third straight time as the betting favorite (9-5), despite the stiffer competition, which included undefeated New York Stallion Stakes Fifth Avenue winner Forgotten Hero (8-5) and Flush, a promising youngster trained by Kiaran McLaughlin fresh off a 7 1/2-length maiden-breaking rout on January 11 (2-1). Flush got out of the gate first from her outside post under Junior Alvarado, but in short order Stonesintheroad darted up along the rail to take over. She led the field through the early splits at a good clip (22.91, 46.12) with Flush pursing a length back second. In the far turn Flush made a bid, getting as far as the throatlatch of Stonesintheroad, but the menace was short-lived. Once the field straightened away for the stretch, Stonesintheroad kicked clear and widened her advantage, winning by an uncontested 3 3/4 lengths. Longshot Wadadli Princess (16-1) outran her odds to finish second, rallying nicely in the lane to nip Flush. Following Flush in order were Maiden Beauty, Quietude and Forgotten Hero, who started poorly. The final time for six furlongs over the fast going was a strong 1:10.66. Stonesintheroad, who was foaled at Waldorf Farm in North Chatham, where her sire stands stud, is out of Dixie Talent, an unraced Dixie Union mare who was purchased by Team Penney Racing for $30,000 at the 2008 Keeneland November breeding stock sale. Dixie Talent has produced six winners from nine foals to start and Stonesintheroad is her first to earn black type. Her top earner is A Shin Ranger by Read the Footnotes, who has bankrolled over $550,000 in Japan. She has a juvenile filly by Big Brown, did not bring a foal to term in 2018 and 2019 and has been already bred back this year to Bustin Stones. All In the Family Racing had good reason to celebrate President’s Day, when new acquisition Bavaro, who was claimed on their behalf by Linda Rice on January 11, handily won the featured $100,000 Hollie Hughes for older New York-breds at six furlongs. The win was a first stakes victory for All In the Family Racing and the third straight win for the 5-year-old grey son of by Freud (Sequel Stallions). The field of the Hollie Hughes Stakes got quite a makeover after scratches. Would-be contenders Honor Up and Syndergaard raced the day before, finishing one-two, just noses apart, in a memorable renewal of the Haynesfield Stakes. Also scratched were likely favorite Build to Suit, a talented Chad Brown trainee, and Runaway Lute. Among the six horses left in the mix, there was a preponderance of early speed. After the break, Eye Luv Lulu, Sudden Surprise and Tribecca took part in the early scrum, before Tribecca, prevailing, emerged to lead the group through an opening quarter in 22.65 pressed along by Eye Luv Lulu. Bavaro, too, looked to get into the action in the relatively early stages. After recovering from a bobble and a bump at the break, he advanced confidently under Junior Alvarado along the backstretch and approach to the turn. Making his way into second early on the bend, he engaged Tribecca and took over as the field neared the quarter pole. Bavaro began his career auspiciously, winning his 2-year-old debut for Bill Parcells’ August Dawn Farm and trainer Gary Sciacca by more than five lengths and, next out, upsettjng the New York Stallion Stakes series Great White Way. Winless as a sophomore, however, he moved his tack to the barn of Jeremiah Englehart but didn’t find the winner’s circle again until May 2018, by now racing in Englehart’s colors at Finger Lakes. Following a strong season, in which he won five of ten starts in all, Bavaro returned to the NYRA circuit and was dangled twice at Aqueduct for a $25,000 tag. When he won by more than four lengths on December 8, he was able to return to his own stall after the race. Following an even more impressive 8 1/2-length blowout on January 11, however, the claim box routed him to Linda Rice’s barn. Bavaro was bred by a partnership of Hidden Lake Farm (where he was foaled), Gunston Hall Farm and Anthony Grey. His dam Chantess, an unraced daughter of Unbridled’s Song, was a $250,000 Keeneland September yearling purchase in 2004, and last changed hands at public auction when purchased by JMJ Racing at the 2007 Keeneland November sale for $150,000. The grey is one of three winners for Chantess and the first to earn black type. She has an unraced 3-year-old gelding by Honorable Dillon named Michael Connor, a juvenile filly by Medal Count, an Into Mischief yearling colt and was bred in 2018 to More than Ready. Bavaro sold as a weanling to Machmer Hall for $20,000 at the 2014 Fasig-Tipton Saratoga mixed sale in Saratoga, before being picked up by Parcells the following year for $85,000 at the Fasig-Tipton preferred New York-bred yearling sale. From nine victories with one second and two thirds from 20 starts, Bavaro has netted $312,605 in earnings. 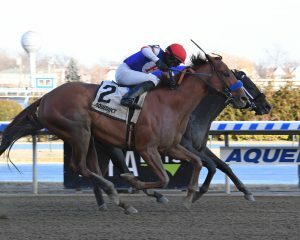 Honor Up just managed to keep his nose in front of a rallying Syndergaard in a thrilling finish to the $100,000 Haynesfield Stakes for older New York-breds run at a one-turn mile at Aqueduct Sunday. This was not the pair’s first meeting. Their one-two finish in the 7-furlong Say Florida Sandy Stakes on January 12, was also a squeaker. In that case Honor Up collared Syndergaard late to score a neck victory. 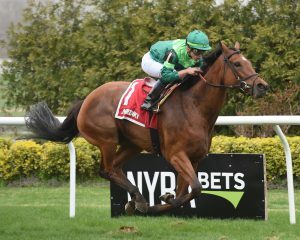 This burgeoning rivalry between these talented older New York-breds is likely to carry on further into the racing season. The 6-horse field of the Haynesfield contained nearly as many intriguing storylines as runners, including the fact that Honor Up and Syndergaard were both cross-entered in Monday’s Hollie Hughes, a 6-furlong tilt for older New York-breds. Arguably the shorter distance was better suited to both horses, but their trainers, Michelle Nevin and John Terranova respectively, felt that the mile would be fine. Also, both horses, as it happens, were making their fifth starts following a trainer switch, and thriving in their new barns. Four-year-old Honor Up (To Honor and Serve) concluded his time with trainer Bill Mott following his 2017 summer campaign. Away for more than a year, he returned last October in Nevin’s care. He shortened up in distance and abandoned any turf experimentation, resulting in three wins and a second in four starts. He was looking for a third straight victory in the Haynesfield. Five-year-old Syndergaard (Majesticperfection), who is named for Mets pitcher Noah Syndergaard, began his career brilliantly for Todd Pletcher in 2016, falling just a nose short of Practical Joke while finishing second in the Grade 1 Champagne Stakes. That year he also won the Funny Cide Stakes. Failing to replicate that form in three starts at three, then away from competition for a year, he took a couple of races in Terranova’s barn – and a bit better of racing luck – to recover his lost form. Recently he has put together a pair of fine efforts, winning a second-level state-bred allowance in December, and finishing second to Honor Up in the Say Florida Sandy. To get things started in the Haynesfield, sprinter Stoney Bennett, who was looking to stretch out his speed to a mile for a second time after winning an open allowance win at the same trip on January 12, shot out of his outside post, and took his customary position on the lead, taking the field through opening early splits of 23.45 and 46.11. Longshot Fiery Opal pressed in second, while Syndergaard tucked in behind the leader to pursue in third. Honor Up, for his part, broke awkwardly and inward. Once he straightened out, he was faced with the task of working his way up into contention in the run up the backstretch. By the approach to the far turn, he had advanced from last into fourth. Gaining ground three-wide through bend, Honor Up took over second and confronted Stoney Bennet at the quarter pole. After battling with that tenacious rival in upper stretch, he took over the lead with a furlong to go. Meanwhile Syndergaard, who had fanned out three-wide for the dash home, found another gear and mounted a serious bid. Despite drifting out in late stretch, he very nearly got the job done, getting on almost even terms with the winner by the wire. When the pair were separated by the photo, Honor Up had his nose in front. The finish was so close, neither trainer Michelle Nevin nor jockey Jose Lezcano were sure of the outcome. Bred by Gainesway Thoroughbreds Ltd and foaled at Vivien Malloy’s Edition Farm in Hyde Park, Honor Up is out of Unobstructed View, a Florida-bred daughter of Yes It’s True who was graded stakes-placed and stakes-placed as a juvenile. Of her five winning offspring, Honor Up is her second stakes winner, following in the hoofprints of his Kentucky-bred full brother Blueridge Traveler who has bankrolled $319,000. Saratoga Seven Racing Partners purchased Honor Up at the 2016 Fasig-Tipton preferred New York yearling sale for $65,000 from the Gainesway consignment. In 15 career starts he has earned $335,513 from six wins, three seconds and a third. 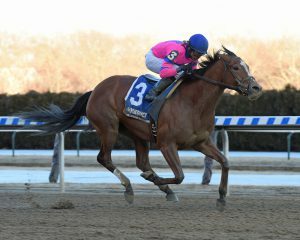 Lady Sheila Stable’s Holiday Disguise got back to her winning ways Saturday when she parlayed her patented closing rally into an open-length victory in Aqueduct’s featured $100,000 Broadway Stakes for New York-bred fillies and mares four-years-old and up at six furlongs. 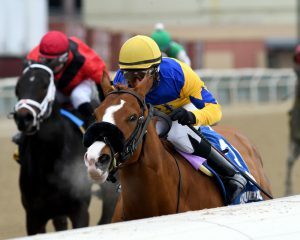 A 5-year-old daughter of Harlan’s Holiday trained by Linda Rice, Holiday Disguise was last seen finishing a disappointing sixth in the Iroquois Stakes on Empire Showcase Day, a performance that belied the mare’s consistently outstanding efforts on the racetrack for the past two years. 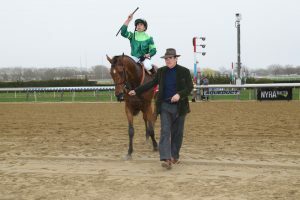 On-the-board in nine straight races at three and four and, at one point, stringing together four straight wins, Holiday Disguise collected stakes victories in the Bouwerie Stakes and Biogio’s Rose – in back-to-back starts eight months apart – the Grade 3 Distaff Handicap and the Critical Eye Stakes for New York-breds. The top-earner in the intriguing Broadway field with history of running well fresh, Holiday Disguise was nevertheless overshadowed in the betting by Broman homebred Pauseforthecause, who was bet down to 4-5. Holiday Disguise was sent off as the 9-2 second choice. After the break, Holiday Disguise settled in her customary position at the rear of the field while, up front, multiple stakes winner and confirmed speedster Filibustin battled for the lead with Absatootly, also a multiple stakes winner, through a testing quarter-mile in 22.31. On the backstretch Holiday Disguise advanced between horses and, by the time the field was rounding the far turn, put herself into contention in fourth, a little earlier than usual. Angling out at the top of the stretch and moving in tandem with stablemate Startwithsilver to her outside, Holiday Disguise started doing what she does best: gobbling up ground in the lane. Passing Absatootly, now back into third, Holiday Disguise collared new leader Pauseforthecause with a furlong to go, and widened her lead to 4 1/4 lengths by the time she crossed the finish line. After a half-mile in 45.90, she stopped the clock at 1:11.13 for the six furlongs. Linda Rice noted that while she thought Holiday Disguise was fit and ready, she was anxious about the race dynamics for her her late-running charge coming into the Broadway. “I was a little concerned because the track has been favoring speed for the last couple of days,” Rice said. “So, that was definitely a concern and also ‘Holiday’ really hasn’t had success [at the distance]. I don’t think she’s ever won a race at six furlongs, though she’s obviously capable of it.” Holiday Disguise has done her best work in longer sprints up to a mile and, coming into the Broadway, was winless in two tries at six panels. Holiday Disguise was bred by Dr. William B. Wilmot and Dr. Joan M. Taylor and foaled at Gallagher’s Stud in Ghent. She is out of Wilmot and Taylor’s Thin Disguise (Yes It’s True), a winning half-sister to millionaire and 2007 New York-bred Horse of the Year Naughty New Yorker out of star broodmare Naughty Natisha. Thin Disguise has produced four winners from five foals to start. Midnight Disguise (Midnight Lute), Holiday’s Disguise’s talented younger sister, has three stakes wins to her credit, namely the Bouwerie Stakes (like her sister) and the Busanda and Busher Stakes. Currently, Thin Disguise has a juvenile filly by Tiznow, a yearling filly by Bodemeister and was bred to Gun Runner in 2018. Holiday Disguise sold first as a weanling, purchased by John Greathouse for $70,000 at the Keeneland November sale. Rice bought her for Sheila Rosenblum’s Lady Sheila Stable the following year, going to $220,000 at the 2015 Fasig-Tipton New York-bred preferred yearling sale. The mare’s fifth career stakes victory boosts her bankroll to $554,875 and improves her record to seven wins, a second and two thirds from 13 starts.